It’s hard to find a historian these days who will say anything good about Senator Joseph McCarthy (1908-1957). For that matter it’s hard to find anyone who will. There is nearly universal agreement that the fellow was bad news. Still the question must be asked: Is this fair? Is this accurate? Or do we simply “run with the herd” on this? Jump on the anti-McCarthy bandwagon and end all further inquiry into the matter? Or, should we re-open the case, so to speak, and take a fresh look? Have his faults been exaggerated and his virtues ignored? Can we say that maybe, just maybe, it ain’t all that simple? Not “black and white?” Good vs evil? “Have you no decency sir?” This question was directed toward McCarthy by attorney Joseph Welch in the 1954 Army vs McCarthy hearings, an episode that effectively ended the anti-Communist crusade of the controversial Wisconsin senator. It’s a question worth exploring. First, let’s look at the facts. Joseph McCarthy, the “infamous” senator from Wisconsin, was a Republican US senator between the years 1947 and 1957 and rose to national prominence immediately after a speech given in Wheeling, WV in February, 1950 in which he announced the presence of Communists in the state department. No recording of the speech exists. Exactly what he said on that occasion remains a matter of dispute. From that point forward, over the next three and a half years, he was the most publicized and best known US American politician except for presidents Truman and Eisenhower. His principal goal was to identify and remove Communists or Communist sympathizers in the US government, particularly those in sensitive government positions. Nowadays the term “McCarthyism” is a negative term used to describe a person(s) employing reckless, callous methods to identify alleged wrongdoers within a large group resulting in irreparable damage done to innocent people and instituting a climate of fear. After an official Senate censure in 1954, McCarthy faded from public view and died in 1957 at the age of 49 from liver disease due to an excessive consumption of alcohol. 1. “Tailgunner Joe” (as he was often called) never served in the military during WW II. False. At the outbreak of WW II, in his early thirties, he volunteered for the Marine Corps and served in the PTO or Pacific Theatre. Exactly how many combat missions he flew is still debated but the general consensus is that he flew twelve, maybe thirteen. He later exaggerated the number of missions upon application for the DSC (Distinguished Flying Cross) which he did receive. Still his exaggerated tales of military service pale when compared to the exaggerated tales offered by other US politicians in those days such as Lyndon Johnson, who managed to get a Silver Star for spending about fifteen minutes in the air on a routine flight where it was highly doubtful that his plane ever came under fire! When McCarthy became a US senator in 1946 at the age of 39, he was the first veteran of WW II to enter that body. 2. He never identified a single real, honest-to-God Communist. His accusations and grandstanding was all for naught, say his critics then and now, “sound and fury signifying nothing.” ONLY the innocent suffered as McCarthy and his colleagues in various congressional hearings dragged their reputations through the mud. He could never locate any real Communists, so it goes, but merely fanned the flames of anti-Communist hysteria. Real Communists seemed strangely elusive and out-of-reach for this big bully of a Senator. So said his critics. Again False. Among those McCarthy identified as dangerous Communists were T.A. Bisson, Mary Jane Keeney, Cedric Belfrage, Solomon Adler, Franz Neumann, Leonard Mins, Gustavo Duran, and William Remington. All, at various times in their lives, McCarthy believed, were committed Communists and serious security risks or worse . Remington, for example, came under suspicion by the US government after WW II (long before McCarthy) for passing classified info to the Soviets. He was charged by the FBI in the late forties but the charges were dropped. Due to the urging of McCarthy, Roy Cohn, (McCarthy’s legal assistant) and others, his case was reopened and Remington, who had held several government positions, was finally brought to trial in 1954, found guilty, sentenced and sent to prison to serve a three year sentence. He was murdered while in prison. Mary Jane Keeny, an employee of the United Nations representing the US government, was pegged as a Communist by McCarthy in February 1950. She and her husband Joe were part of the “Silvermaster Spy Ring” connected to the GRU, or Soviet military intelligence. The two had long been under suspicion by the US government when McCarthy mentioned her in a speech. She was dismissed from her job. In 1952 the Keenys were convicted on contempt of Congress before a senate committee but their convictions were later reversed on appeal. Later research into declassified documents in the 1990s by cold war historian John E. Haynes firmly established their treasonous espionage activities. In both cases McCarthy examined their files and was incensed that such persons were still working for the US government. In the Keeny case, McCarthy had no idea at the time as to the extent of their treason; it was far worse than even he suspected. They never served a day in jail but, due to the work of the Senator, they also never again served in a government position, an outcome that likely suited him just fine. He knew that getting convictions against such persons was a long-term, expensive process. Simply getting them out of the civil service would have to do. Solomon Adler, though never called in person to the Senate floor, was named twice by the controversial Senator in the hearings. Adler, an unapologetic admirer of Mao, was part of the US state-department China circle in the nineteen-forties. When the heat turned in his direction in 1950 he bolted the USA and went to England, the place of his birth. Later, in 1960, he returned to mainland China and spent the remainder of his life in service to his adopted country living to a ripe old age . Look him up on Wiki-pedia. Sounds like a “Commie” to me. Of course, three names do not let McCarthy of the hook completely. He mentioned lots of folks in the hearings, most of whom easily escaped further Senate notice. But NOT FBI notice. Or the notice of McCarthy supporters who were convinced that he was on the right track. McCarthy moved through a long list of names and got almost no support from Millard Tydings, the Democrat Chairman of the sub-committee assigned to handle the McCarthy business. Why? More on that later. Joe McCarthy called General George C. Marshall a “traitor” and a “Communist.” Again false. No way. Though the textbooks often say it, he never used those words. But…. his June 14, 1951 anti-Marshall speech on the Senate floor was probably his greatest tactical error. The upstart young Senator from Wisconsin was David against Washington’s Goliath this time. Caught up in the heat of the moment McCarthy let loose a blistering diatribe against the sainted general that would cause his enemies to go into overdrive and his friends to cringe. 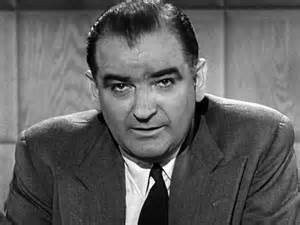 But, to the thoughtful, it was obvious that McCarthy was squarely on target regarding much of what he said. Among other things, in his late 1945 visit to China, McCarthy believed, the sainted general had been swayed by advisors and associates such as Solomon Adler negatively disposed to Nationalist leader Chiang Kai -shek and had been manipulated into disastrous decisions that hurt Chaing and helped Mao Tse-tung. The triumph of Communism in mainland China had occurred only a few weeks before McCarthy’s initial speech in Wheeling. In one fell swoop, another one fourth of the world’s population went under the hammer and sickle. Those were dark days indeed for the cause of freedom and democracy. McCarthy was not Marshall’s only critic. In a disaster of that magnitude, heads will roll. Ordinarily. But not this time. The sainted general and his China associates in this episode would keep theirs. Marshall was, in the view of millions, beyond criticism, a pillar of virtue. And his associates? Innocent by association. But not in the eyes of Joe McCarthy. Right or wrong, the Irish Catholic street-brawler from Wisconsin had clearly crossed a line in this speech. And his enemies would not forget it. And, in the coming years, nor would many lazy historians compiling their dubious US history textbooks, books for which one pays a hundred dollars one year and is lucky to resell the next year for a fraction of that! More on McCarthy next time. More charges and more rebuttals. Sources: BLACKLISTED BY HISTORY, M. Stanton Evans, Wiki-pedia, and JOSEPH MCCARTHY: Reexamining the Life and Legacy of America’s Most Hated Senator by Arthur Hermann. We took a little bacon and we took a little beans and we fought the bloody British in the Battle a’ New Orleans. We’ve all heard the song, a catchy Country & Western ditty originally performed some fifty years or so ago by singer Johnny Horton, telling the story, though not with great accuracy, of how Andrew Jackson and his rag tag band of frontiersmen defeated a larger force of seasoned British regulars driving the survivors back onto their ships never to return. And if we know our US history as we should, from that point on the US had no more serious problems from Britain, our old nemesis, who had no choice but to take on a new found respect for their former colonies. One cannot overestimate the importance of this battle. For many years, Jan.8, the day of battle, was celebrated as a national holiday. At the time it must have seemed miraculous. The odds all seemed in favor of the British. It was a battle that never should have been fought. At the time it occurred, a treaty designed to bring hostilities to an end had already been signed weeks before. But neither the invading British or anyone on the US continent yet knew of it in early 1815. A US delegation consisting of Henry Clay, John Quincy Adams, and three others had arrived in Ghent, Belgium in the Spring of 1814 eager to meet with their British counterparts and bring an end to an utterly frustrating war that had gone on for nearly two years. Though there had been some success on the high seas and the Great Lakes, things had not gone so well for the US. Poorly led forays into Canada had only resulted in US reverses on the ground. Worst of all, a British raid, in retaliation for one of these US raids into Canada, had resulted in the humiliating near destruction of the new capitol Washington City. The principal cause of the war had been the impressments of US sailors on the high seas by British ship captains. Time and again US ships had been boarded and forced to give up seamen to serve on British naval vessels sorely in need of crews to fight in their protracted war against France, always on the pretext that the men thus seized were really Englishmen and therefore belong on a British ship. “Once an Englishman, always an Englishman” they would say. The British delegation had made it clear that they would not budge on this. In addition, they refused to surrender any part of Canada. The expeditions into Canadian territory had been for naught. Still the US delegates were hopeful that the Brits just might agree to stay out of Indian affairs in the old Northwest, what is now Ohio, Michigan, and Indiana. That was something. But it wasn’t much, and certainly didn’t justify the cost in men and material already expended in a war with an enemy like Great Britain. The treaty, if signed, would be simply a return to the pre-war status quo putting an end to hostilities. Unsatisfactory it was. But the time had come to bring the war to an end, time to cut US losses and accept something far short of victory. Those were the orders from a tired, beleaguered president James Madison, more or less. Bring this to an end even if it meant that the US gained little or nothing. For months the delegates in Ghent tried to do just that but the British delegation, a group of lower level diplomats who seemed to hold little real authority, kept putting off meetings with their US counterparts, stalling and postponing as if they held little enthusiasm for an end to hostilities, waiting for a better situation to develop from which they might bargain from an even stronger position. The desire for peace seemed one sided indeed. For the US delegates in Ghent, it was a humiliating state of affairs. Finally in December 1814 they met once again, worked out a deal and signed the papers on Christmas Eve ostensibly bringing hostilities to an end and a return to the pre-war status quo. On the subject of impressments the paper, as expected, was silent. The US simply hoped that with the war in Europe ended and Napoleon in exile, (which had been accomplished by that time), the British need for seamen would be diminished. Furthermore, they hoped that the Brits would quit meddling in Indian affairs south of the Canadian border. Based on hope, good faith and the possibility of mutual respect, the thing really had no teeth in it. Most unsatisfying. The US delegates still sensed something odd with the Brits, as if there was unfinished business, as if they were hiding something. We must ask: did the British commissioners know what their people were up to in America? It’s hard to say, but surely they had an inkling of it. Surely they had heard rumors of British plans for America. Three weeks before the signing occurred Vice Admiral Alexander Cochrane sailed from Jamaica with ships full of British troops toward the mouth of the Mississippi Rivers and the biggest Gulf Coast prize possible : the city of New Orleans. His ships contained thousands of highly disciplined veterans of the Napoleonic War, arguably some of the best soldiers on the planet. These soldiers had little reason to worry about what awaited them. In the opening phase of the war in the Northern theatre around the Niagara Falls area and the Great Lakes, poorly led US troops, both state militia and regulars, had met with little success. Later when the British made their raid on Washington City, the Maryland state militia that marched out to defend the new capital city had been scattered and dispersed by British troops in a matter of minutes, their performance a profound embarrassment. No, the British troops filling those ships bound for New Orleans weren’t worried. By all reports, the American army, if it could be called an army at all, would give them little trouble. Once the fleet departed whatever occurred in Ghent would be of little consequence. News traveled very slowly in the early nineteenth century. As he set sail from Jamaica Admiral Cochrane still had no word of a signed treaty or of any cessation of hostilities. Though he likely knew that such a thing was in the works, until he had word of it and was ordered by his superiors to turn around, he and his army colleagues would sail for New Orleans. That city would be a good bargaining chip. It was only sensible. They would sail up the river, take the city and whatever they found useful and valuable there, and await further orders from king and parliament, who, they were quite sure, would be reluctant to relinquish such a prize once it was in British hands, regardless of what those silly commissioners in Ghent did. The British had never recognized the Louisiana Purchase of 1803 anyway, a highly questionable transaction between Napoleon, their mortal enemy and an illegitimate ruler to boot, and the Americans. Furthermore, any treaty signed in Ghent had to be ratified by Parliament . With New Orleans in British hands, that fussy bunch might decide that the treaty just wasn’t acceptable in its present form and needed more work and send their commissioners back to Ghent and back to the drawing board. They could delay and postpone indefinitely while the city was emptied of all valuables, spoils of war. If the Americans did not like it? Too bad. There was precedent for this. The British had, after all, stayed in New York and Charleston for nearly two years after the surrender at Yorktown. The Americans fumed and fussed but there was little they could do about it. The British government pulled troops out of those places only when they were good and ready and the Treaty of Paris was complete. Thirty years later they could do the same in New Orleans. That is if they ever decided to give it back at all. Which they just might not. But there was no time to waste. It had to be done quickly. Meanwhile back in US territory just north of Mobile Bay, General Andrew Jackson, a seasoned Indian fighter nicknamed “Old Hickory” with a three thousand man “army” of Tennessee and Kentucky frontier militia, having just wound up a successful campaign against the Creek Indians turned his attention to reports he had received that British ships were preparing to depart for New Orleans. Without delay he put his men on the road and they all headed for the Crescent City. There were some forces already at that place he had been informed, who, coupled with his, stood a good chance of turning back the invasion. Jackson had no experience fighting the British or Canadians or any modern army, only Indians. That didn’t stop him or, as far as we know, or give him the slightest hesitation. About two weeks later, Jackson and his small army walked into New Orleans to a grand welcome about the time the British sailed from Jamaica. The British were coming and everybody knew it. They got to work immediately, organizing the city’s defenders, constructing fortifications, and scouting and studying the terrain downstream to assess just what approach to the city the British army might take. Jackson and his men worked steadily and efficiently and even succeeded in enlisting help from the well known local pirate- smuggler, Jean Lafitte- a wise move indeed. No one knew the territory better than this fellow. Bad news met the British as soon as they arrived at the mouth of the Mississippi in mid December. First, Jackson had beat them to New Orleans. Cochrane had suspected it. Rats. Spies in Jamaica. But he had to be philosophical, it’s hard to hide a dozen of Britain’s finest warships filling up with thousands of soldiers in a busy harbor, hard to keep such a thing secret. Word would surely get out. And where were those ships full of troops headed? It didn’t take a genius to figure it out. New Orleans was the only logical destination. It got worse. After a day or two of inquiry among locals, reconnaissance, and scouting, the British discovered that none of the paths to New Orleans were without substantial risk. Moving thousands of men and animals and baggage, etc. from point A to point B fifteen or twenty miles down the road is not always a simple matter even in the best of terrain. In this place of bayou-swamp, water, and squishy-soggy terrain, any movement of a large body of troops across what little firm land was available could be easily anticipated and blocked by Jackson’s men. The Brits quickly came to the grim realization that the area would be much more easily defended than they had at first supposed and that they would probably be forced to make the fight on ground that their enemy had carefully chosen. Being veteran warriors they knew well that a smart defender would attempt to draw his attacker into a trap. Already they sensed that Jackson was not the sort of fool that the British and Canadians had usually opposed in the far North on the other end (so to speak), of the Mississippi River. Cochrane and his generals, at least privately, started to get a bit nervous. So the story goes. On December 23 a slow-moving reconnaissance-in-force under the command of General John Keane marched toward the city and came under attack by General John Coffee’s Tennesseans. The Brits held firm and ran the attackers off. Casualties on both sides were moderate. Historians have speculated that this was a golden opportunity for the British, that Jackson’s command was in some disarray at that moment and thus vulnerable to a determined British counterattack and advance. But hearing reports that Jackson had many thousands waiting for him just down the road, Keane choose caution. He took up a defensive position and waited for further orders with his enemy blocking that road to New Orleans as before and growing stronger by the minute. The American “rabble”, Keane was forced to admit to comrades, had performed reasonably well. They wouldn’t be a pushover. The British were heartened by the arrival on Christmas Day of Sir Edward Pakenham, brother-in-law to the famous Duke of Wellington. Surely this fine military leader would have some answers. Outwardly he exuded confidence. It was rumored that he had already been commissioned to serve as governor of Louisiana once the American rabble had been brushed aside and the city seized. Pakenham wasn’t impressed with the British performance so far and seemed more than a bit worried in the initial meetings of general staff and officers. Predictably enough, he and Cochrane quarreled prompting the admiral to say: “If the army shrinks from the attack here, I will bring up my sailors and marines from the fleet…and march into the city.” Regardless of his personal misgivings, Pakenham would not let that challenge go unanswered. One way or the other, the army would make the fight. Jackson made sure that Pakenham would get all the fighting he had bargained for and then some. For his defensive position, he settled upon a thin strip of land on the Chalmette Plantation about twelve hundred yards long with a cypress swamp on the left and the Mississippi River on the right. Over the course of two weeks his men erected a long thin wall or rampart of various types of material including cotton bales parallel to a canal in their front that served as a moat. Field artillery with trained crews and plenty of ammunition was placed at appropriate intervals all along the line. His frontiersmen, fellow Tennesseans and Kentuckians, sharpshooters all, would defend the left side of the wall and an assortment of others, including a regular US army unit, a Louisiana militia comprised of free “men of color”, and Jean Lafitte’s men, would defend the right flank by the river. The wide open field out front was always soggy and devoid of any cover. It was a good position. The British, located but a half mile or so in their front, had to leave them alone giving them plenty of time to improve and strengthen the wall. The plain in front of the US position was far too mushy even for harassing British field artillery to be deployed and the large guns on the warships couldn’t be used since it was too risky to bring those enormous vessels with their deep draft within range of the US position on the river. Therefore the Brits could not use their biggest and best weapons . And they had brought along no heavy long range mortars. They could only wait nearby and watch the Americans, that backwoods rabble, make their strong position even stronger. It must have been maddening. British officers knew that the only path to New Orleans was through the Chalmette Plantation. Still they weren’t, for the most part, overly concerned. Most fully expected the bunch they now called the “dirty shirts” behind that crude wall to abandon their position and run for home once they saw the his majesty’s splendid scarlet legions drawn up in battle formation with fixed bayonets coming toward them. Others, particularly the rank and file carrying muskets, weren’t so sure. For them one thing was certain: even if they did manage to push the Americans aside and take New Orleans, it would come at a high cost. Many of them would never see the place. Whatever the case, a withdrawal from this American homespun rabble was unthinkable. To go home without a fight? Preposterus! They had come too far to turn back. Honor demanded a resolution of the business, one way or the other. They had gone to a great trouble and expense to get to this point and they had no choice but to finish what they had started. They would make the fight. Though this was his first time to war with the British, the American commander behind the wall with four thousand under his command was equally determined not to disappoint them. It was well known that Andrew Jackson held a special contempt for the redcoats, ever since a British officer had whacked him over the head with his sword for refusing to clean his boots when he was but a boy of twelve during the Revolutionary War. His family and friends had suffered greatly during those years. Jackson was not a forgiving man. He was one to hold grudges. Now it was time for payback. As every US school boy and girl once knew, the main British attack came the morning of January 8. It has been universally understood that the British attack was nothing but a rash, risky and bold frontal assault against a strong American position. Was it? Not exactly. There was a bit more to it than that. 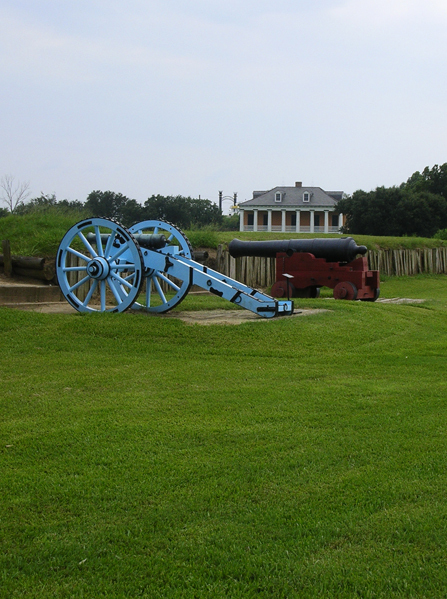 Along with the main assault across the Chalmette plain, an amphibious task force of several hundred men commanded by one of Pakenham’s finest officers, Colonel William Thornton, would be dispatched to seize an American position on the West bank of the river located within artillery range of and covering Jackson’s right flank. If that position could be quickly taken just prior to the main assault, the guns already there could be turned on Jackson’s Chalmette line in an enfilading barrage that would substantially weaken that part of the line giving the main assault a far better chance of success. Still, this plan, sensible as it was, depended on careful coordination, a cooperative river current, the element of surprise, and most of all, a bit of luck. But luck was not with the British that day. The two armies had been staring at one another for nearly a month now. With a great sense of relief, the British regiments marched toward the US position. By all accounts, they looked splendid, banners waving, mounted officers shouting commands, and the field music, including bagpipes with two highlander units, echoing across the soggy plain. With a thick fog obscuring their view, the Americans waiting anxiously behind the ramparts could not at first see but only hear the British, which worked briefly to the advantage of the latter. But within minutes the fog melted away in the sun and the full splendor of the British advance came into view. As soon as they were within range, the US artillery opened up tearing wide gaps in the magnificent scarlet lines. They closed ranks and pressed forward. These grim-faced veterans of the Napoleonic wars, among them the Ninety-third Highlanders and the Forty-fourth Irish regiment of foot, came on without hesitation into what the poet Tennyson would have called: “the valley of death.” No it wasn’t a valley but a broad now well lit soggy plain, but for these brave soldiers equally deadly, a killing field unlike any field they’d ever marched across. The wide-eyed US soldiers gripped their rifles and muskets and waited for the order to fire. It must have seemed an eternity. And the British came on. All at once, when the British had come within 200 yards the order was given. American rifle and musket fire exploded into a continuous boom. Within the clouds of thick gunpowder smoke carefully rehearsed Americans all along the line in teams of four stepped up to their place in line and fired, then fell back a few feet to reload as the next man stepped up to take his place, take aim, and do likewise. For thirty to forty minutes they maintained this process and poured a continuous barrage of deadly fire into the exposed scarlet ranks. No, they didn’t look like much but they didn’t turn and run as most of the British had predicted. They stood fast and fired their weapons as ordered. Ammunition wasn’t a problem, they had had weeks to get ready for this. On the American side of the wall it was mighty noisy, hard to breathe and hard to hear the officers and sergeants shouting orders but otherwise it was fine. Very few were getting hurt. In some portions of the line no one was getting hurt. In front of the American wall, out in that vast soggy plain, it was pure hell. Entire portions of the front line evaporated as men went down and others fell back in the withering hail of lead. The Ninety-Third Highlanders steeped into the breach in front of the Tennesseans and advanced to the front, bagpipes roaring. For a minute or two all around them, determined survivors of the front lines, took heart and attempted to close ranks, ready to follow them should they lay ramps down, cross the moat, throw up ladders, and scale the ramparts. But the colonel of the ninety-third was shot down by grapeshot almost instantly. One hundred yards from the American line the British hesitated and began to fall back. Men dropped every second. Pakenham himself spurred his horse and rushed toward them waving his sword shouting words of encouragement as men fled from what had become a murderous melee. Struck by a missile, his horse faltered and went down taking the general with him. As he struggled to his feet, he was stuck in the lower back, paralyzed, and carried from the field. All other generals in the assault went down as well. After thirty minutes or so of the slaughter, the only general still on his feet was John Lambert, a veteran of many battles, several hundred yards in the rear commanding the reserve battalion . He watched in agony, as the splendid army disintegrated. Hundreds of wounded and dazed British soldiers staggered toward him and his waiting men drawn up in anticipation of a coup de grace that would never happen. He could only watch the terrible drama unfold before his very eyes, unbelieving. It was the most shocking, humiliating moment of his long military career. Across the river on the West Bank, things had gone little better for the British, but not good enough. Colonel Thornton’s men had managed to take the fort and scatter the American garrison. But there had been delays (as always happens in war) and they were too late in accomplishing this. Just prior to fleeing, the American artillerymen had had time to spike the cannon, rendering them useless to the British who, like Lambert and his men, were then forced to watch helplessly at the disaster unfolding across the river on the Chalmette Plain. Had they taken the fort earlier and done so quick enough to capture the guns intact, they could have turned them on the American line as planned at just the right time and the outcome of the battle might have been different. But that was merely what might have been, not what was. The fort was a prize that meant nothing now. Thornton and his command were ordered to abandon it, return to their boats, and rejoin what was left of the British army. The bloody thing was over. With no general left to command them, all had been shot down, the British abandoned the field in great confusion leaving large piles of their dead and wounded in front of the Americans. Pakenham himself died shortly after being taken to the rear. Among the great battles of US history, the Battle of New Orleans has to be the shortest in duration. The actual fighting lasted, astonishingly, only about thirty minutes. It had taken that long for the Americans to transform a well led, confident army of five to six thousand of the best soldiers on earth into a leaderless, dazed and demoralized army of about three to four thousand. Thirty minutes. Furthermore, it is hard to find a more lopsided victory in our history. About seven Americans were killed and six wounded. For the British, approximately three hundred were killed and thirteen hundred wounded and over four hundred captured. Two thirds of the attacking force including all generals became casualties. The British had boldly marched into a massacre. And the city had been saved. By all accounts it is hard to measure who was more shocked at the outcome, the Americans or the British. Tennessean John Coffee, Jackson’s right hand man, saw the hand of God: “Surely Providence has had a hand in the thing.” William Carroll came to a similar conclusion. Stunned and shaken, the British knew that they would have a lot of explaining to do when they returned to friendly territory. It had been one of the most decisive and embarrassing defeats in English history. Ten days later, they sailed away. There have been no British invasions of US territory since. Word of the victory at New Orleans reached Washington on Feb 4 and New York and various other major cities on the eastern seaboard over the next few days as fast as horse and rider could accomplish it. Victory celebrations broke out across the nation and everywhere people toasted Andrew Jackson, their new hero. News of the Treaty of Ghent and the offer of peace from Great Britain arrived a bit later, in the midst of the great victory celebration already in progress. Though most government officials knew better, to the man on the street it appeared that the British had sued for peace because after the bitter defeat way down South they had no choice. Hooray! The war was over and the US had won, an impression that Washington officials and nearly all elected political leaders made no attempt to change. This suited them just fine. Andrew Jackson had unknowingly taken a humiliating, inglorious stalemate and transformed it into a glorious victory . The treaty of Ghent was all but forgotten. Jackson’s battle outside New Orleans is still being celebrated. Twelve years later General Jackson became President Jackson and arguably, one of our most influential. No, this fledgling new nation across the Atlantic was not to be trifled with. From 1815 onward, if the British wanted to expand their colonial empire, they would have to look elsewhere. Thirty years later, when the US finally got around to making an offer, the British would cheerfully relinquish control of the Pacific northwest territory, and all claims to any lands now contained within the “lower forty eight.” No longer a threat, the British would become in the next century a close friend and ally in two world wars and several smaller ones. Nowadays the UK is likely our closest ally. But none of this, so it seems, would have happened had they not been soundly defeated at New Orleans. Before the US and Britain could be friends and allies, the British had to get a real drubbing from an American army. They had to be taught a hard lesson. The Battle of New Orleans was about as decisive as it gets, every bit as important as Saratoga or Yorktown. In a sense, this battle put a grand finishing touch on the American Revolution. After the Battle of New Orleans, our Revolutionary War was finally over and the task of building a nation could now begin in earnest with no more fear of British interference. THE NASHVILLE RETROSPECT, The War of 1812, Part X, by Tom Kannon. January 2015.